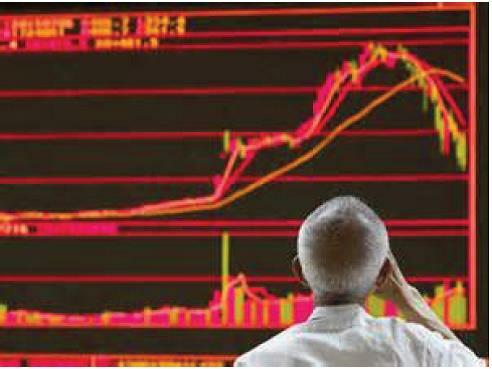 China’s stock market appears to be back in free-fall, despite the Chinese government’s efforts to control stock prices and stem the panic. The chief culprit appears to be leverage: investors last year and in the first half of this year borrowed billions in order to buy stocks on margin, offering little or no collateral except the shares themselves. As prices fall and stock values drop below the level of debt, it triggers margin calls from the lenders, which forces investors to sell at any price, further depressing prices, causing more margin calls in a downward spiral whose bottom is not easy to see from here. 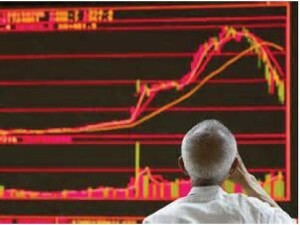 A recent report said that the volume of these margin loans dropped by 6%, or $23 billion over the past five trading days, which implies that there is still $383 billion more that could be called over the next months or years, an alarming 9% of the roughly $4 trillion in total market value on the Shanghai market. But leverage is only part of the problem. The CSI Information Technology Index, a mix of high-tech names in China similar to the Nasdaq in the U.S., is still trading at around 75 times earnings, while Nasdaq’s PE is closer to 30. If the two indices were to normalize, it would imply that Chinese stocks could drop an additional 60% in value before the current bear market has run its course—and that’s assuming the debt situation doesn’t cause the market to overshoot on the downside. One complication in the situation is the fact that, since late last year, foreign investors have been allowed to invest directly in Shanghai-listed stocks. Savvy market traders with years of experience in these death spiral events have been making program trades which bet on further drops. Chinese regulators recently suspended 34 U.S.-based hedge fund accounts from trading, including the Citadel Fund, and short selling is now totally forbidden. Meanwhile, the economic fundamentals in China aren’t looking good. The Caixin China Manufacturing Purchasing Manager’s Index recently fell to levels which indicate economic contraction, and industrial output is at the weakest level since November of 2011. You don’t often see a market rally when an economy is sliding into recession, so at these valuations, you aren’t likely to find many bulls left in the Shanghai China shop.